Courses are validated by the Health & Care Professionals Council and are recognised for providing excellence in education and training. The courses have been developed in partnership with employers, service users and carers, which ensures the education and training they provide is up to date with developments in practice and promote the wellbeing of individuals, families and communities. Students can practise their skills in a range of placements supported by experienced practice educators. 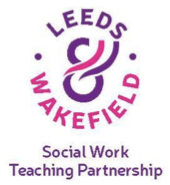 We have a unique teaching partnership with Leeds and Wakeﬁeld local authorities to provide the very best in education, training, employment and continued professional development. As a partnership, we strive for excellence in all aspects of social work. The courses are delivered by experienced academics who are also registered social workers, bringing their practice experience to their teaching and research for the benefit of students. Professor Nick Frost undertakes international research in the area of childhood, multidisciplinary work, family support and safeguarding and he currently serves as an independent chair of a Local Safeguarding Children Board. Within his research, Dr Darren Hill explores contemporary social work issues such as mental health and addiction and social work model of practice within contemporary children’s social work services. The team is research active, with several members of staff undertaking doctoral research within key areas such as emotional resilience, participation of children and young people in child protection, working with fathers and adoption and ethnicity.